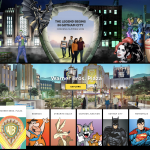 Warner Bros World Is Opening In Abu Dhabi! Calling all Acts & Performers – Join Us! Or visit our contact page for more info! Artiste Representation - Join Us! Are you a performer, musician, dancer, or entertainer with a specialty act? Are you interested in joining ShowWorld? Visit the pages below to discover what we require from our performers.